How many final high-resolution photos do I get from the shoot? Can you pick up my wine? Can I ship my wine to you? Is my wine stored in a temperature controlled environment when in the studio? Do you return the wine? What color backgrounds do you have? Can you send me the final image on CD? Can you photograph at my winery, office or some other fabulous location? Can I give you a specific fabric to use as the background? Can I come to the studio for the shoot? Do you shoot events like winery events or weddings? Can you Photoshop vintages or remove the vintage on my bottle? What is a clipping path and will you provide a clipping path of my bottle? Classic bottle shots cost $125 for a single bottle photo on a solid or textured background or with the bottle removed from the background (also known as “clipped out”. Styled bottle shots and Group bottle shots require a bit more information in order to provide pricing since each project is different. Call to discuss. Though I may shoot several variations of your bottle for Styled and Group photos, you get to pick one as your final image. Additional versions are billed at the same rate for the type of bottle shot you purchased. 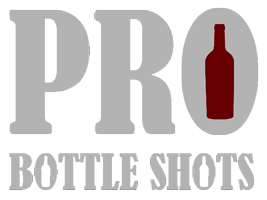 Online proofs are typically posted within 24 hours, and final photo delivery of Classic bottle shots takes another 12-24 hours depending on the number of bottles. Styled and custom photos take a bit longer to process but expect them in a few days. Maybe. Depends where you’re located. Call to discuss. Please call or email us before shipping your bottles. Your wine will be stored in a cool temperature controlled environment during its time in the studio. We’re not liable for the conditions it’s kept during shipping to / from the studio (unless we’re delivering ourselves). Are you and my wine insured? Yes, your wine is insured during its time in the studio. A delivery memo or bill of lading is required with the date of transfer to our care. Liability is limited to 10 calendar days. That’s up to you. Common props include wine glasses, wooden boxes, other wine bottles, corkscrews, etc… see the gallery for examples and inspiration. Nearly every color under the rainbow. We also have some textured backgrounds available. Let me know what you have in mind or view some previous photos. Your digital proofs will be posted to an online gallery on the website within as few as 12 hours. After you pick the image(s) you like, the final high-resolution artwork will be sent shortly after that via Dropbox or other online delivery method. CDs are so yesterday but if you like I can send you one. There is a $10 charge per CD and includes standard USPS postage. Sorry, due to a union strike delivery via carrier pigeon has been discontinued. Sure thing! There is slightly higher pricing for that service since I have to set up all the gear it takes to beautiful bottle shots. Let’s chat about it. Yes, but we should discuss it to make sure it’s going to give you the results you want. Sure. Can I hangout in the winery while you make wine? Nah.. just kidding. Art directed sessions are billed based on the project instead of the per bottle pricing model. Most of my clients trust that I’ll deliver the images they require and are not present during bottle shoots. If you’d like to schedule a date and time, please contact me. Why is the pricing higher to shoot on-location? Traveling with and setting up a bunch of professional lighting gear takes time, my friend. I’m able to provide great low prices because I have dedicated studio space already setup for this type of shooting. We’re having an event at our winery – do you photograph events, too? Sometimes. I provide event photography around the globe. Literally. Contact me with details at (707) 931-0127. Can you Photoshop in other vintages or remove the vintage on my bottle? Maybe. Several factors have to be considered like: the design and style of your label, the font used, the finish, etc… Removing a vintage is sometimes easier if you want an evergreen photo, and billed at $125 per hour. I need to see your artwork to best determine. Clipping paths are outlines of the bottle so you can remove the background and “float” it over any background in print layouts or webpages. They are included in Classic Bottle Shots. There is a $45 charge for clipping Styled and Group bottle photos, and the actual photo determines if it’s possible. Still have more questions? Let’s chat.